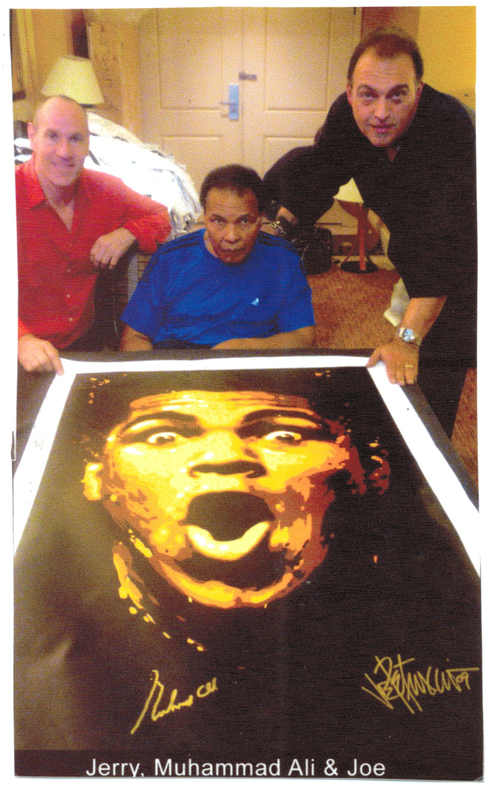 The recent passing of boxing legend Muhammad Ali stirred up a great deal of emotion within me and caused me to reflect on my interaction with him several years ago. Muhammad rarely picked up his head or took a break. It was difficult for me to comprehend—until the moment when he finished the very last piece. Then I saw the pay-off: He looked up and gave us that famous Ali, bigger-than-life smile. You could see he indeed enjoyed what he was doing very much. When it was over, I was asked to help the champ to his car. What an honor and a privilege! As I walked and helped support Muhammad’s body, I could feel the power and strength he still had. He wasn’t what he once was, but his life’s spirit was still easily felt. Over the years, whenever I have had the opportunity to be with Muhammad, I have always found him to be warm, generous and insightful—always looking to accommodate others. Muhammad Ali (born Cassius Marcellus Clay, Jr., on January 17, 1942) earned his nickname, “The Greatest” by becoming one of the greatest boxers ever to fight. In his career, Ali fought several historic boxing matches against other boxing greats: Sonny Liston, Joe Frazier, Floyd Patterson, Ken Norton, George Foreman and Larry Holmes, to name a few. He won gold in the 1960 Rome Olympic Games, and when he was only 22 years old, he won his first heavyweight championship against Liston. He went on to become the first three-time World Heavyweight Champion in history. Ali’s pre-match hype with fighters and sports journalist Howard Cosell were priceless. Who could ever forget the way in which he described his fighting style: “I float like a butterfly and sting like a bee!” Ali had a career like none other; he was crowned “Sportsman of the Century” by Sports Illustrated, and is one of the few athletes that crossed over from sports figure to world icon. At one point in our lives, all of us need to decide—and possibly risk much for—what we believe. Too often we back down because of uncertainty regarding the outcome, or because of the personal price we may have to pay. My limited words and experiences offer some useful insights, but I think we can learn much more by focusing on what Ali was willing to sacrifice and lose for the principles and values he held so closely. A villain to some and idolized by others, he was willing to go to jail and give up one of the most coveted awards: the World’s Heavyweight Boxing Championship. He was a polarizing and controversial figure, particularly early in his career. He came to the forefront of boxing during one of the most tumultuous eras in modern history: The 1960’s will forever be remembered for the counterculture and hippie movements. Activism was full in swing. Student protests focused on civil rights, women’s rights and the Vietnam War. Daily headlines featured wide-ranging, controversial stories and figures, like burning draft cards, the “British Invasion” led by the Beatles, the assassinations of President Kennedy, Malcolm X and Dr. Martin Luther King, Jr., whose “I Have a Dream”speech characterized a decade like no other. He was arrested and found guilty of draft evasion. He barely avoided a prison sentence, but he was stripped of his title, had his boxing license suspended and did not fight again for over three years. His appeal worked its way up to the U.S. Supreme Court where 1971 the Justices overturned Ali’s conviction in an 8-0 decision. Seven years after his title was taken away, he knocked out George Foreman to become heavyweight world champion once again. Quite an accomplishment for a young boy from Louisville, Kentucky, who started boxing in 1954 as an 89-pound, twelve-year-old—after his bicycle was stolen. In 1984 he was diagnosed Parkinson’s disease. He was inducted into the International Boxing Hall of Fame and was the recipient of the Arthur Ashe Courage Award in 1997. His boxing gloves are preserved in the Smithsonian Institution National Museum of American History. Since retiring from boxing, Ali has devoted himself to humanitarian efforts around the world. Now he fights world hunger and poverty; he supports education efforts. It is estimated that he has helped to provide more than 22 million meals to feed the hungry. Read more him and other champions and outstanding people in my international best-selling book, THE COMMON THREAD OF OVERCOMING ADVERSITY AND LIVING YOUR DREAMS.